4,731 kilometers, 15 days, nine cities and three passionate travellers – one family on the road in the 911 Sport Classic. With his wife Rachel and his three-year-old son Ethan, Russell Shand from Scotland embarked on a journey along the most beautiful roads of Europe – and in a very special vehicle: the 911 Sport Classic. 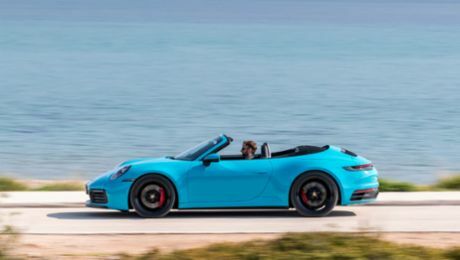 This model, refined by the Porsche Exclusive factory, combines tradition and modernity with an increased performance, double-dome roof, ducktail rear and 19-inch Sport Classic wheels. Porsche only produced 250 of these cars between 2009 and 2010. "With the Sport Classic gleaming clean and just serviced at Aberdeen Porsche Centre, we cruised down from Scotland to Newcastle England and arrived at the ferry Terminal in ample time. When we started to drive onto the ferry we had butterflies in our bellies with excitement that our Tour was really going to commence. And tomorrow we were going to wake up in another country in Europe." "After an unexpected rough North Sea crossing we drove off the ferry at Amsterdam. We changed the Sport Classic’s Speedometer from Miles to Kilometres on the computer and set the Sat Nav for our hotel in Stuttgart. […] Almost as soon as we crossed the border into Germany we were on the first Autobahn. […] The SC felt solid and planted on the Autobahn at speed. It was undeterred by any cross winds from passing trucks and it showed what a comfortable long distance high speed cruiser it could be. Any random lane changes from other motorists in front of you were also efficiently dealt with confidence by the Porsche Ceramic Brakes." "Porsche kindly arranged for us to meet the Porsche Team involved with the project including and also a tour of the factory and Classic Dept. This was an excellent day and it will stick in our memories forever." "Leaving the hotel we immediately started with hairpin bends at the base of the Stelvio Pass. Climbing higher and higher we passed through some low cloud and then saw the piles of snow at the side of the road. The roads were damp but clear and it wasn’t long before I got into the rhythm of the bends increasing my speed as my confidence grew. […] The grip was excellent and only ever offered to break away with the overzealous use of my right foot. […] We continued on our mountain pass mission now heading down the other side of the Stelvio Pass towards Livigno. This was equally as exciting and the scenery was breath-taking. We decided to take the ‘Munt la Scherera Tunnel’ into Switzerland. […] Once we arrived in Davos we then headed south towards Italy and Lake Maggiore. On the way there the Sat Nav decided to take us off the motorway near the San Bernardino Pass and showed us the Via Mala. We continued to head south down to Locarno and then down the left hand side of Lake Maggiore and onto Stresa"
"When we arrived in Monaco, much to our delight the Monaco Grand Prix Circuit was still set up from the week before! We had to do it before checking into the hotel! When we arrived at the hotel the Sport Classic attracted a lot of attention from Car Spotters. We had to reluctantly hand the keys of the SC to the hotel valet who seemed delighted to accept!" "We did the Monaco Grand Prix Circuit again just for fun and then drove the Coast Road from Monaco to Nice; Antibes and onto Cannes. […] The road was gorgeous with the turquoise sea of the Cote d’Azur at one side and the red orange cliffs on the other. The road again twisted its way around the coast which was an excellent drive." "After reuniting ourselves with the SC we headed back along the coast from Cannes towards Milan and then into Switzerland via the San Bernardino Pass. Beautiful scenery again and arrived at the hotel in Lucerne, Switzerland." "We departed Cologne and got our last taste of the Autobahns before heading into Holland. We arrived at the hotel and tucked our friend up in the underground carpark. Unbeknown to us the hotel carpark is a mecca for Car Spotters and again the SC seemed to draw much attention." "We loaded our Porsche Luggage into the SC, (this made an easy job of storing our clothes for this trip, it definitely is a must and worth investing in.) We then left the hotel and we arrived at the ferry terminal at Amsterdam. With sad heavy hearts the realisation that our tour of Europe was about at an end. The sights and experiences we had seen on this tour were unforgettable and the memories will stay with us forever. What was equally unforgettable was how the 911 Sport Classic tackled this tour with ease. It cosseted two adults and a 3 year old boy and they’re luggage in perfect comfort. A perfect grand tourer and when unleashed a capable mountain pass sports car." "We arrived in Newcastle to a dull misty morning and headed north, home to Turriff, Scotland." Porsche also posted a clear delivery increase in September.